NSF is the National Sanitation Foundation (not to be confused with the National Science Foundation! ), a global independent public health and environmental organization. Together with the American National Standards Institute (ANSI), the organization established a standard called NSF/ANSI Standard 61 (NSF-61). If you manufacture, sell or distribute water treatment or distribution products in North America, your products typically must be certified for NSF-61. FDA is the Food and Drug Administration. This federal agency is responsible for protecting and promoting public health by controlling and supervising food safety, tobacco products, dietary supplements, medications and more. Poly Processing chemical storage tanks are not FDA-approved. 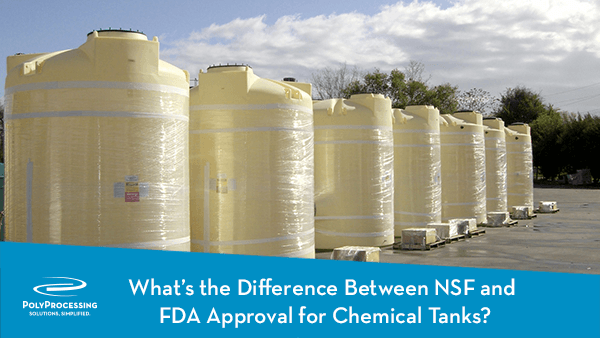 In fact, no chemical tank can claim to be FDA-approved, because the approval can only refer to food and drugs. If a tank manufacturer makes that claim, steer clear from them—either they don’t know what they’re talking about, or they’re pulling the wool over your eyes. However, machinery that is used in food processing must comply with FDA requirements. So when you’re looking for a storage solution, be sure to ask if the tanks are FDA-compliant, or if they meet FDA requirements. Our chemical storage tanks are FDA-compliant, and we can provide a letter from an FDA attorney that states our tanks meet all FDA requirements. The Food and Drug Administration and Code of Federal Regulations (CFR) specify the guidelines for food and beverage storage under Title 21, parts 176-177. These regulations outline the acceptable resins, additives, and tank composition guidelines. Poly Processing offers resins compliant with FDA/CFR Title 21, parts 176-177 specifications. You can review the resin technical data sheets for details. Many tank manufacturers have certified tanks, but that doesn’t mean their fittings and gaskets are NSF/ANSI certified. Poly Processing is the only chemical storage tank manufacturer with a full system approach to NSF. We provide entire tank systems that are certified for NSF/ANSI 61, including fittings, gaskets and specific tank colors. We have NSF-61 Certification for 35 of the most popular water treatment chemicals on our XLPE tank systems. Our certifications also cover XLPE tanks with OR-1000 (our engineered antioxidant barrier). Poly tanks are certified for both potable water and chemical storage. Stainless steel has long been the tank material of choice for storage in the food and beverage industry. Historically, businesses have been hesitant to choose polyethylene storage solutions, believing the porous resins would allow leaching and bacterial growth. But with advanced resin technology, polyethylene offers FDA/CFR compliant storage with cost savings advantages for food and beverage operations. Food and beverage industry leaders such as Campbell’s Soups and Anheuser-Busch enjoy the economical advantages and one-piece seamless construction Poly Processing polyethylene storage tanks offer. Are you looking for a cost-effective, one-piece, NSF-certified or FDA/CFR-compliant storage solution for your food or beverage operation? Contact a Poly Processing storage specialist for more information and a custom solution.